I haven’t written about a Tarot card in quite a while, but in honor of Nathan Lee‘s new podcast, Six Of Swords, let’s look at that card! 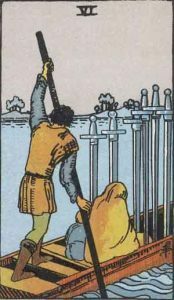 My memory palace-based method of memorizing and using the Minor Arcana tells you two things right away about the Six of Swords. Firstly, sixes are all about love – every Six in the Minor Arcana has something to do with love. Secondly, the Swords are about elemental Air, and they deal with the intellect, the mind, rationality, and frequently the inevitable. This leads me to think that the Six of Swords is about love of knowledge. But let’s look at the imagery of the card to see if this holds water. The classic Six of Swords from the Rider-Waite-Smith deck shows a boatman and two passengers on a boat with everybody’s back turned to the viewer. Like most Swords, there is a somber and morose feeling to the picture. Things look cold and lonely. The passengers aren’t talking to each other and the boatman is disinterested. On the surface, it’s hard to see any love portrayed in this card. However, water plays a big part of the story being told, and water is the element tied to emotion and feelings. The vessel, driven by air in the sails, is the interface between the intellect and emotions. Love and knowledge come together in the Six of Swords. The Six of Swords is frequently associated with travel and making a journey. This is a very literal interpretation of the imagery in the card, and I would offer something more metaphorical. Love of knowledge leads to learning, and learning is a journey. You travel from ignorance to understanding, and by learning, you are indulging in anamnesis, the Platonic process of opening your soul to Divine knowledge. Opening your soul to new knowledge is an important part of tikkun olam, the healing of creation. Knowledge can also bring pain, though. “Ignorance is bliss,” goes the popular saying, which means that getting rid of ignorance can mean abandoning bliss and taking on the responsibility and weight that new knowledge brings. This explains why none of the characters on the Six of Swords are in a good mood. They leave their bliss behind to open themselves up to new knowledge, and they do this not because of a simple love of knowledge, but because of a love of the Divine. This is a card about accepting the burden of knowledge through love. Yes, there is a love of knowledge, but this is just the gateway through which one learns the love of the Divine, the anamnesis that aids in the healing of the world. 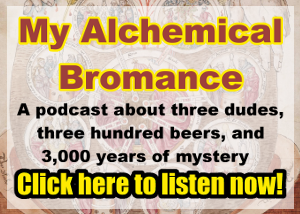 After spending more time with the Six of Swords, I understand more behind Nathan Lee’s choice for the title of his new podcast. It’s a great choice! Go check out the first episode of Six Of Swords here. Even though I have a different interpretation of elemental assignment (for me wands are air, and swords are fire), your viewpoint adds a deeper meaning when considering the love aspect of the sixes.